Further to my last post, I’ve had more encounters of the insect variety. In fact, the more I tried to insect-proof the house, the more the various beasts and bugs seemed to pop out of every nook and cranny. I found a spider in my washing – did it go through the machine or just drop off the line and into my wet washing in the basket? Either way it was dead or, as that Monty Python sketch about the dead parrot goes, just resting. I prefer dead to just resting. Then the other morning I woke up to ants crawling over the kitchen sink and in the bin even though I’ve distributed discs of ‘Ant Rid’ about the place. And just to add variety, it being the spice of life, a large earwig had draped itself across my sofa. However I’ve made progress on the spaniel scratch front. I visited a groomer to sort out the dreadlocks behind Bertie’s ears as he wouldn’t stay still enough for me to cut them out myself. If you’re familiar with spaniels – cockers in particular – you’ll know that they have very long, thick and curly ears which can become repositories for food, water, sand, fluff, grass seeds and more. I’ve done my best to keep on top of the combing but he doesn’t make it easy for me. Anyway, it was day four of Melbourne’s recent heatwave when we visited the canine crimper. The melting asphalt stuck to my shoe as I got Bertie out of the car and so it was a relief to enter the air-conditioned haven of the pooch parlour and to be greeted by the upturned faces of lots of small, smiley-faced fluffy dogs, looking positively Disney-like in their cuteness. So far so good. The groomer lifted Bertie onto the table and said, more like, barked: “Why haven’t you taken him to a groomer before?” Take aback by her abruptness, I stuttered something about not realising I should have done so. “The breeder should have told you to do it in the first six months. 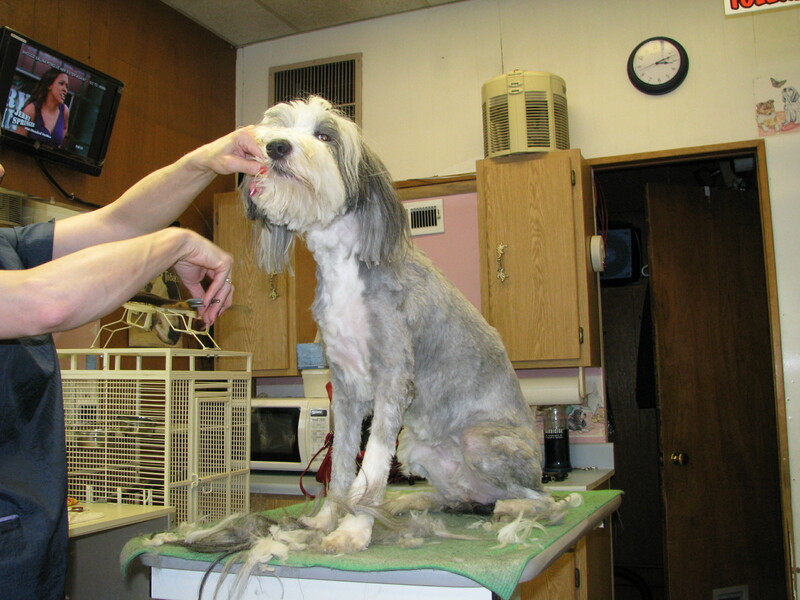 A dog needs to get used to a groomer otherwise they end up having to have an anaesthetic at the vet’s before you can cut their nails and hair,” she continued, accusingly. “And why haven’t you had him de-sexed?” Determined to stick up for myself, I replied: “Because I haven’t chosen to do so yet.” In fact, and I didn’t share this with her – the animal rescue stickers were enough to explain her strict stance on de-sexing, some of the research says that (population control aside) leaving a male intact until he is up to two years old is beneficial for joint and bone growth. “See these grass seeds?” she said, grabbing a clump of matted fur by his ear and snipping and then shaving the area down to the skin, “they not only cause infections, they can get into his blood stream and affect his heart.” “Well,” I protested, “I have tried to groom him but he bites me and wriggles about.” “That’s because you’re doing it like this,” she retorted, miming yanking the comb through his ears. “With all due respect, I haven’t been doing it like that,” I said getting hot under the collar. How dare this woman imply I am a bad mother! Little does she know I am the one who has read all the books (well some…), who put a ticking clock and hot water bottle in his bed in the early days to ease his separation from the litter, who made him a special digging pit, showered him with toys, who takes him for two walks a day, puts filtered water in his bowl, experimented with special diets for his sensitive tummy and tried acupuncture to make him a bit less hyper-vigilant! On the positive side, she did do a good job and she also clipped Bertie’s nails. But that’s not the point. Did she really need to be so blunt, bossy and critical? Imagine if I were like that with my clients. Why have you not over-hauled your website before now? Had it de-jargoned? And what about the fluffy grammar? Had you left it any longer, I would have refused to help and sent you to the web doctor. How we communicate says a lot about who we are. A generous interpretation of this woman would be that she has a closer affinity with animals than with humans. I found it amusing that she was modelling typical alpha female leader-of-the-pack–I’m-in-charge behaviour. For a short while I had a boss like that. She had a mane of curly hair and arms adorned with bangles. She’d sit down at a meeting, spout jargon and hammer out a point by clopping her bangles on the table and sweeping her leonine hair off her face. On this occasion, however, I learnt a valuable lesson about grooming (I now comb Bertie’s ears daily) and Mum will be thrilled his nails have been cut. Just in time! She landed this morning and is now unpacking. What’s more my neighbour built the self-assembly fan for me so we’re all sorted. I am a new mother! After many years of deliberating, I finally took the plunge and got a canine child, a beautiful and hugely lovable chocolate brown cocker spaniel field spaniel cross. Bertie arrived just over a month ago and in the best possible way has turned my house, life and wardrobe upside down. Because Bertie is spirited, cheeky and headstrong. And, like all dogs, he needs to know who is boss. But how you go about establishing boundaries and asserting yourself is open to debate. One of the first challenges was to stop him from hurling himself at the sofa every evening, nipping me with his piranha-like milk teeth and ripping the fabric with his sharp little claws. When he knows what’s what, I’ll invite him up to sit beside me on his blanket, but for now, he needs to know that NO means NO. One doggie expert told me to read What’s Your Dog Telling You? by Martin McKenna. McKenna recommends that you fold your arms, raise your chin, glare down at your pup from the side of your eyes and give a deep, impressive growl. And to be as scary as possible! The thinking behind this is that the mother dog wouldn’t pack her dog into the car and take him to obedience classes; she would give instant feedback. I duly tried this but my growl was deeply unimpressive and totally unconvincing. What’s more my niece videoed me looking totally goofy (I was in my fluffy dressing gown) and we both ended up laughing hysterically. Other puppy owners told me to squeal (again this requires channelling your inner canine) if he bit me – even in play – and that that would deter him. It didn’t. He just came back for more. Then I contacted a dog trainer and she suggested pushing him down firmly and matching the intensity of my pushes to the intensity of his jumps. Bertie thought this was a tremendous game and it got rougher and rougher until I was wearing thick woollen gloves to protect my hands against his nips. What’s more I didn’t enjoy pushing him down so roughly. Next, we went to visit the vet to get Bertie vaccinated. She told me to encourage the behaviour I wanted to see with lots of edible treats (she must have given him about 10 in as many minutes) and to simply ignore the bad behaviour. Easier said than done – I couldn’t ignore those teeth and insistent barks when I tried to turn away. So what did I do? Well, finally I relied on my intuition and summoned up my firmest and lowest-voiced (shame I’m more of a soprano) NO and then gently – ever so gently – placed him down in a sit position and either gave him an edible reward or a bit of tlc (which is really what they want). I’m happy to say that I can now watch the television or read a book without having to growl, push, squeal or reach for the band aid. It’s really confusing being a new Mum, but we’re getting there, Mr Berts and I.